STORM BOXX™ for Sale in Brookfield, MA | BRIAN'S TRUCK EQUIPMENT INC.
For the really big winter storms, the full line of FISHER® STORM BOXX™ pusher plows allow contractors to optimize snow clearing performance. 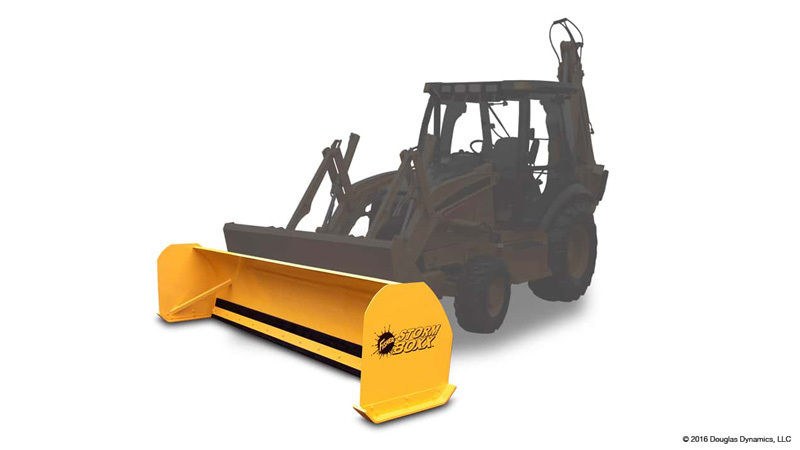 Pusher plows easily attach to your skid steer, backhoe or wheel loader to clear parking lots, roadways and sidewalks in Brookfield, so you can operate your equipment all year long. Available in 8' and 10' widths, the STORM BOXX™ pusher plow for skid-steers moves up to 7 and 9 cubic yards of snow. The 36"" x 36"" sideplates feature side support posts, which provide protection against bending from curbs or other accidental impact. The professional-duty, premium rubber cutting edge is specifically formulated to balance flexibility with rigidity for unmatched durability on any road surface. It is adjustable and reversible to allow maximum use before requiring replacement. The long lasting, abrasion-resistant steel wear shoes also extend the life of the cutting edge. The universal skid-steer loader mounting plate makes hook-up fast and easy. Simply align the mounting plate with the u-plate, engage the pins, and you’re ready to plow. Available in 10' and 12' widths, the STORM BOXX™ pusher plow for backhoes moves up to 9 and 11 cubic yards of snow. The 36"" x 36"" sideplates feature side support posts, which provide protection against bending from curbs or other accidental impact. The professional-duty, premium rubber cutting edge is specifically formulated to balance flexibility with rigidity for unmatched durability on any road surface. It is adjustable and reversible to allow maximum use before requiring replacement. The long lasting, abrasion-resistant steel wear shoes also extend the life of the cutting edge. A structural steel channel across the entire blade is internally-lined with stiffener ribs for structural integrity and bucket-impact strength. The quick change attachment system features fully formed gussets that support both the upper and lower post, which connect directly with the internal stiffener ribs for strength and support. Available in 12’, 14' and 16’ widths, the STORM BOXX™ pusher plow for wheel loaders moves up to 15, 18 and 21 cubic yards of snow. The 48"" x 48"" sideplates feature side support posts, which provide protection against bending from curbs or other accidental impact. The professional-duty, premium rubber cutting edge is specifically formulated to balance flexibility with rigidity for unmatched durability on any road surface. It is adjustable and reversible to allow maximum use before requiring replacement. The long lasting, abrasion-resistant steel wear shoes also extend the life of the cutting edge. A structural steel channel across the entire blade is internally-lined with stiffener ribs for structural integrity and bucket-impact strength. The quick change attachment system features fully formed gussets that support both the upper and lower post, which connect directly with the internal stiffener ribs for strength and support. Sideplate 36" x 36" 36" x 36" 36" x 36" 36" x 36" 48" x 48" 48" x 48" 48" x 48"